Each library hosting the Manifold Greatness traveling exhibition offers a unique set of resource for its viewers. At Eastern Mennonite University, the Hartzler Library has had on view a number of Bibles from its Menno Simons Historical Library, a special collection of Anabaptist/Mennonite materials. Manifold Greatness was on view at EMU from January 26 through February 21, 2013.We’ve selected some unique items from the Menno Simons Historical Library to share in this post. 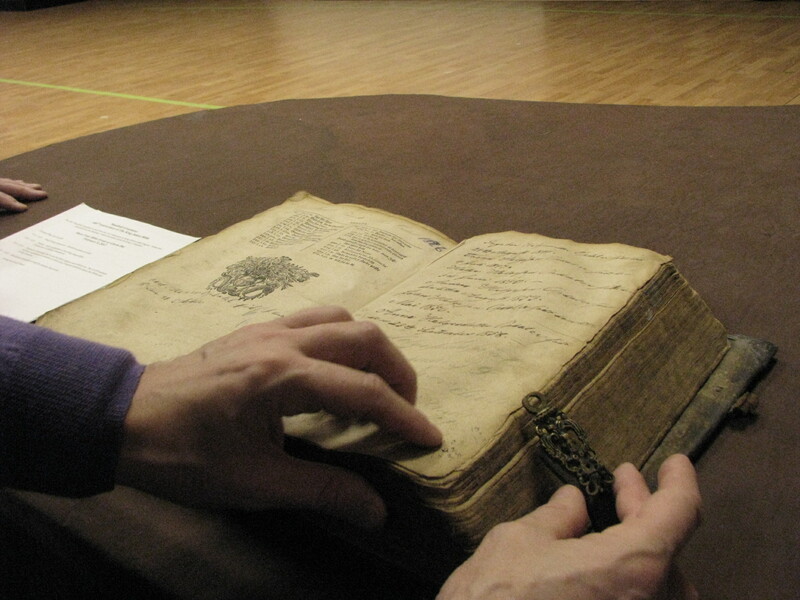 Please scroll down to see these remarkable, historic Bibles. 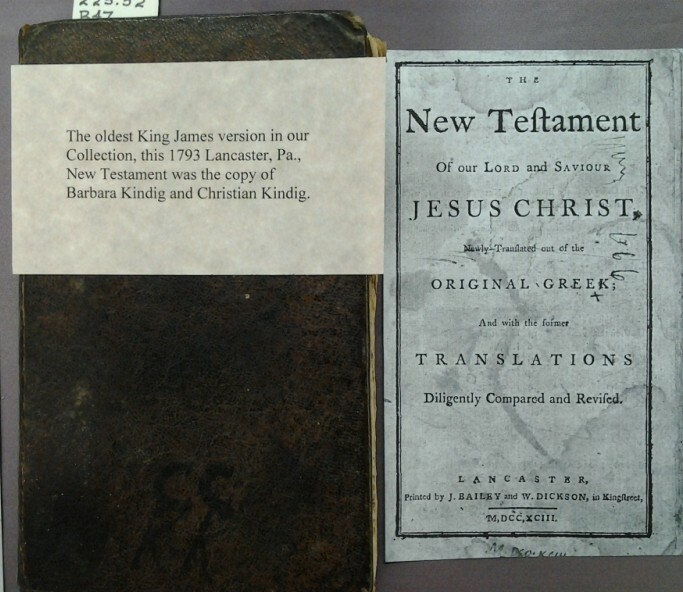 Oldest King James Bible in the Menno Simons Historical Library collection, and its title page. Lancaster, PA, 1793. Menno Simons Historical Library. Image courtesy of Eastern Mennonite University. Also on display is this New Testament from 1527 with the text in Greek, Latin which was translated by Erasmus and the Latin Vulgate. Title page of En Novvm Testa. Basel, 1527. Menno Simons Historical Library. Image courtesy of Eastern Mennonite University. The collection has a number of German Bibles since many Anabaptist groups who settled in the Eastern United States spoke German. German Bible published by Froschauer. Zurich, 1549. Menno Simons Historical Library. Image courtesy of Eastern Mennonite University. The collection also includes a copy of an 1853 Chinese New Testament. 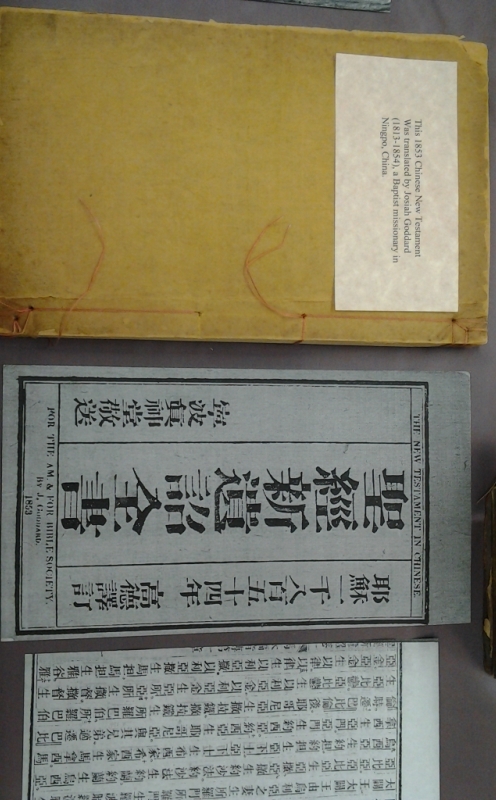 Chinese New Testament and title page. For the Am. & For. Bible Society, 1853. Menno Simons Historical Library. 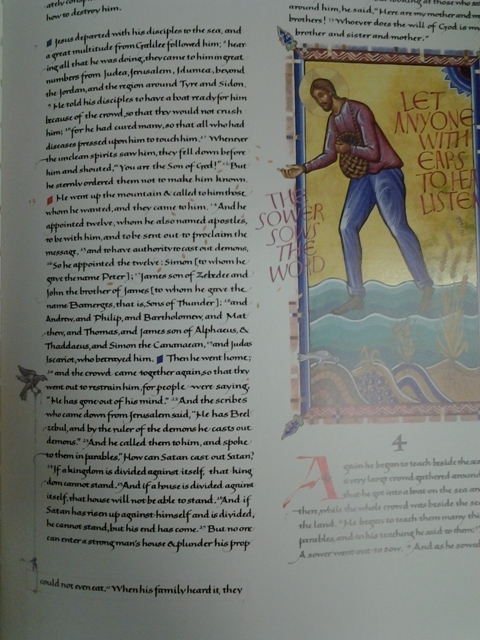 One newer item we made available was a facsimile St. John’s Bible, a handwritten and hand-illuminated Bible commissioned in 1998. 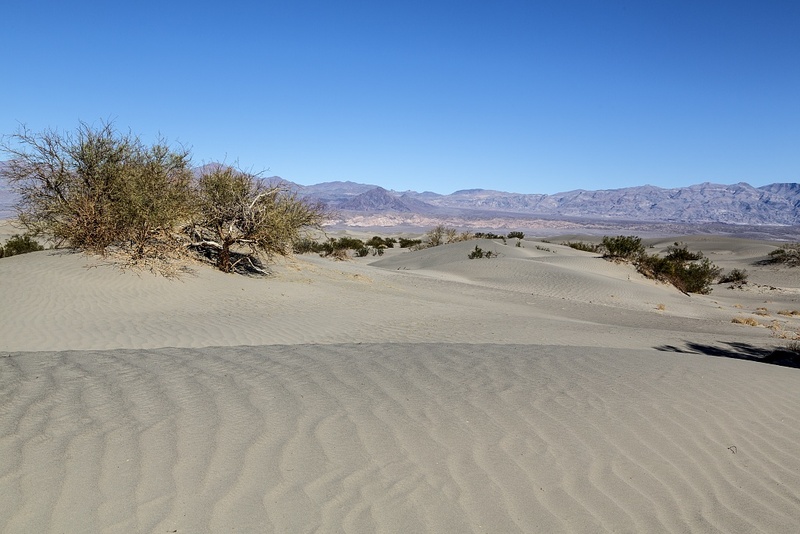 The uniqueness of each location is seen in their resources and programing. We are happy to share these works with our community, and with the readers of the Manifold Greatness blog. From the Gospel of Mark, chapter 3. Collegeville, MN, 2005. Hartzler Library, Eastern Mennonite University. Image courtesy of Eastern Mennonite University. 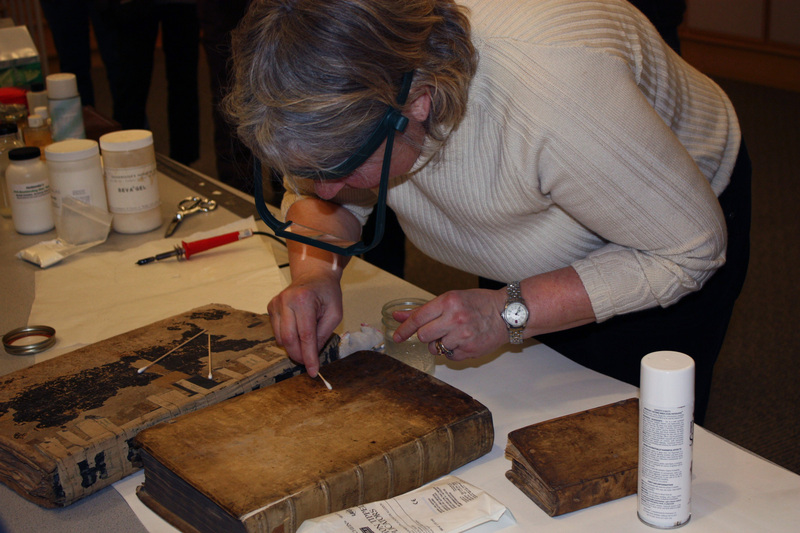 Jennifer Ulrich is a Technical Service librarian at Eastern Mennonite University. 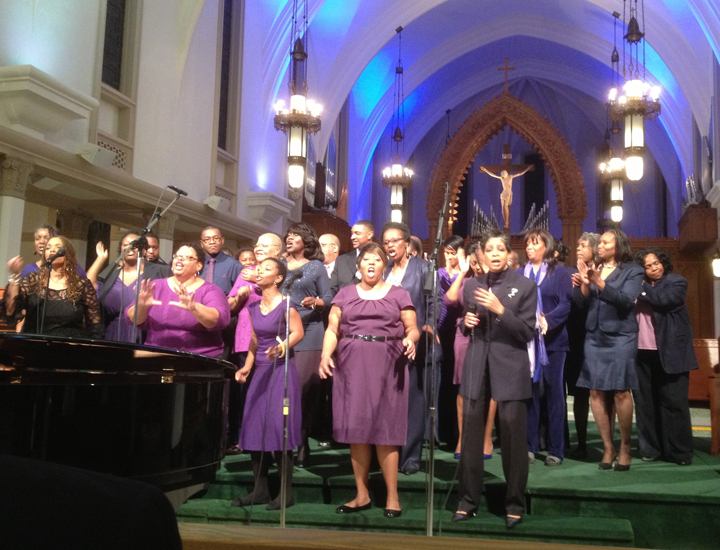 On Monday, February 11, at the third of four programs designed to explore the themes in Manifold Greatness (and as a part of Loyola Marymount University’s Black History Month celebration), the Sacred Praise Chorale of Faithful Central Bible Church in Inglewood, CA performed works directly inspired by the words of the King James Bible. The Sacred Praise Chorale chorale performs at Loyola Marymount University. Photo by Jeannine Emmett. The concert, directed by pianist and soloist Diane White-Clayton (affectionately known as “Dr. Dee”), took attendees on an inspiring, energetic musical performance of eight works of that spanned eighty years of worship music written by African American composers. Reverend Jason Darden, Protestant and Multifaith Campus Minister at LMU, provided moving commentary between songs, and the 120 guests of all ages in attendance left with their hands tingling from clapping and their hearts elated by the honesty, beauty, and soulfulness of the performance. After the concert, guests and performers walked from the Sacred Heart Chapel to the William H. Hannon Library for a reception and viewing of Manifold Greatness: The Creation and Afterlife of the King James Bible. I invited Dr. Dee and Reverend Darden to share their personal perspective on the role of the KJV in their life. “The King James Version of the Bible with its poetic colors and literary prominence has been the source of artistic inspiration for composers for centuries. This is especially true of African American composers. A culture which relies heavily on lyrical oratory, the Black church in America is often filled with the words from this great work, whether quoted by a pastor in a sermon, read as the Sunday morning scripture, spoken antiphonally by congregants and reader, or sung in the lyrics of the choir’s musical rendition. “The King James Bible holds a very special place in my heart. I grew up as a preacher’s kid; not only was my father a preacher but my grandfather as well. I can remember sitting in the pews and listening to my father and grandfather preach from the King James Bible. I memorized scripture using the KJV and whenever I quote a passage during a sermon I always seem to resort back to my KJV vernacular. Jamie Hazlitt is Outreach Librarian and Manifold Greatness program director at Loyola Marymount University in Los Angeles, CA. Members of the Mennonite community view Manifold Greatness at Elizabthtown College. 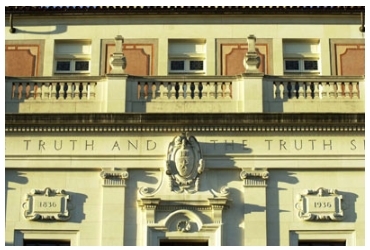 Photo courtesy Elizabthtown College. 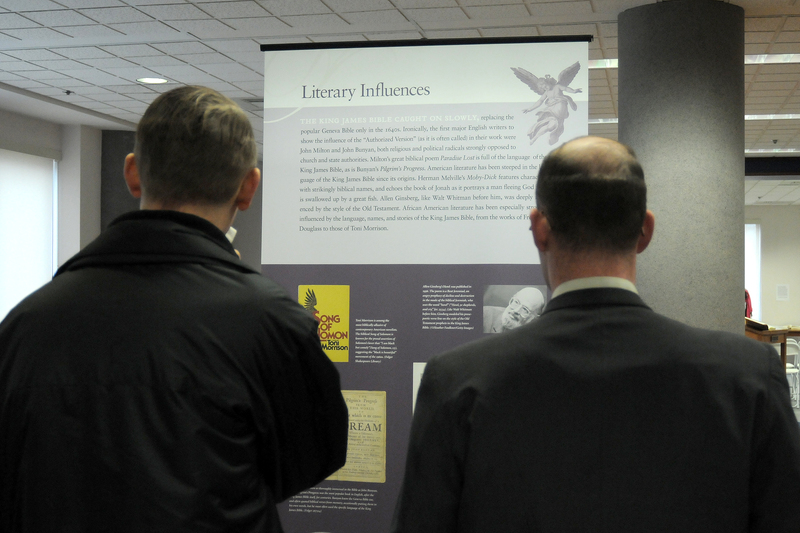 On February 2, central Pennsylvania welcomed the Manifold Greatness traveling exhibit to the High Library at Elizabethtown College. The reception has been overwhelming and we could not be happier with the enthusiasm and support for the exhibit. Even the weather has worked out in our favor and the programs have gone on without a hitch! We also hosted a panel discussion on February 6 as scholars discussed “Shakespeare, Literature and the Language of the King James Bible.” Speakers included Professors Christina Bucher, Louis Martin and Suzanne Webster. On February 7, we were mesmerized by our Elizabethtown’s own Professor Patricia Likos Ricci who lectured on “The Bible as a Work of Art.” Professor Ricci will replay this lecture on February 19 at the Elizabethtown Public Library. We will also hear from our own Professor Jean-Paul Benowitz on Family Bibles. 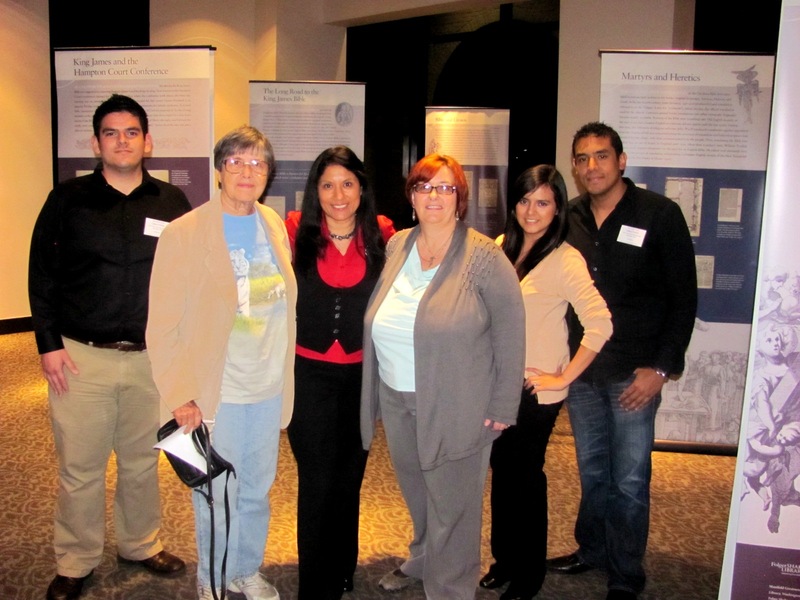 It has been wonderful to see and experience all the diverse backgrounds and generations who have visited the exhibit. We have had young, old, Mennonite, Brethren, Catholic, Baptist, and Protestant visiting the exhibit. Our youngest tour thus far has been a group of middle school students who really enjoyed hearing about the Wicked Bible from our student docent, Annemarie. We also hosted a group of Old Order Amish who toured the exhibit with Professors Jeff Bach and Don Kraybill. The Manifold Greatness exhibition has also provided an opportunity for the High Library special collections to be featured. 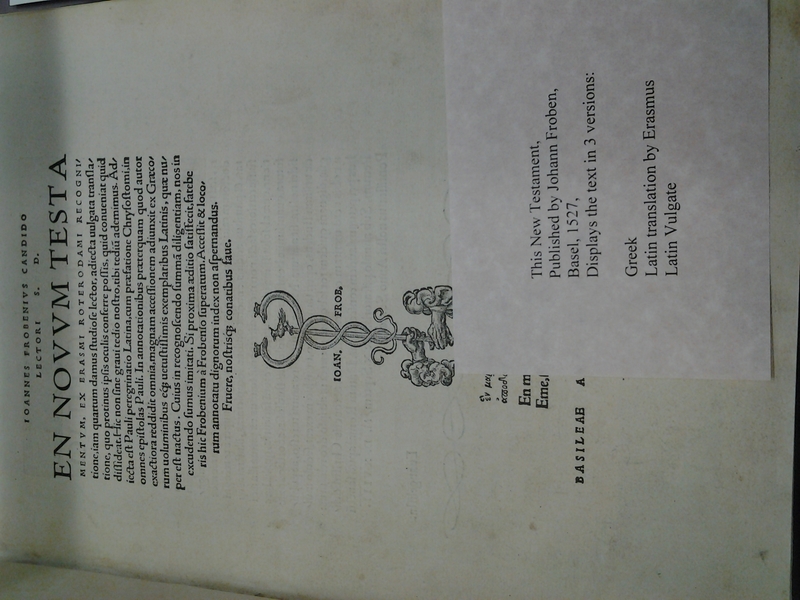 We have displayed the High Library copy of the 1599 Geneva Bible, the rare 1712 Marburg Bible, and the Berleburg Bible. In addition to the unique displays, the visitors have also enjoyed using iPads we have setup to connect them directly with the audio tour of the exhibit provided by the Folger Shakespeare Library. We hope to continue to reap the rewards of the amazing exhibit and are looking forward to another fantastic 2 weeks with the King James Bible. Louise M. Hyder-Darlington, M.S.L.S. is Access Services Librarian and Project Director for the Manifold Greatness traveling exhibition at the High Library, Elizabethtown College in Elizabethtown, PA. The Rev. Dr. Charles Sumners. Image courtesy Pikes Peak Library District. Pikes Peak Library District in Colorado Springs, CO planned an ambitious month of programming to celebrate Manifold Greatness. Our events were varied, including a concert, lectures, public discussions, and several film screenings built around KJB: The Book That Changed the World. This dramatized documentary by actor John Rhys-Davies retraces the history of the King James Bible. The first screening brought so many people that we couldn’t fit them in our largest community room. We quickly realized that the demand for this programming was higher than we had anticipated. We asked our local city-run senior center and faith-based organizations to lend us space and technical assistance for additional screenings, which we ran through the month of June. Some of our Manifold Greatness scholars hit the road with us and facilitated lively public talks directly following each screening. The Reverend Dr. Charles A. Summers (retired) led two programs that featured films and discussions about the King James Bible. 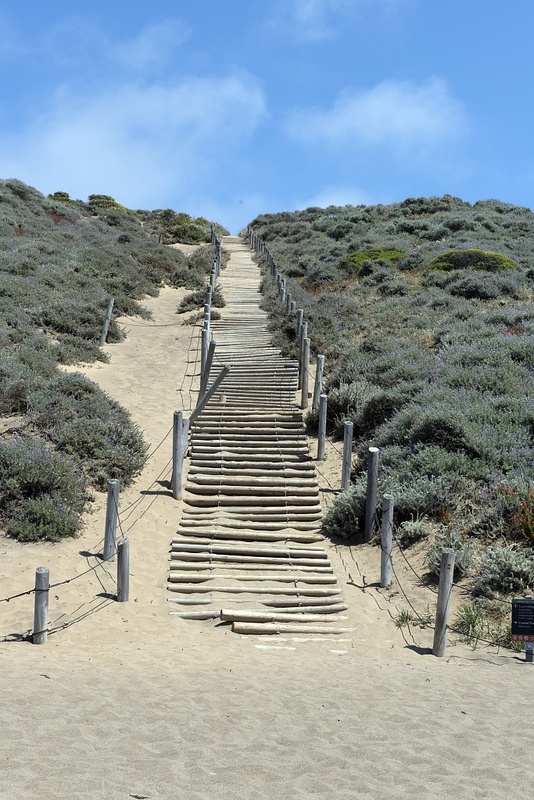 “Even though the KJB is specifically part of my heritage as an Anglican/Episcopal priest, I was glad we could utilize resources from other faith groups to understand its history,” he commented. Audiences actively participated in programming around KJB – the Book that Changed the World, including a recitation from memory of the King James Bible version of the Twenty-third Psalm while it was read aloud. “They were surprised that they could do it but then commented that it was almost subliminal,” Sumners said. Other interactive activities included discussions about the process of Bible translation in general, and the process of creating a documentary about the Bible. The Reverend Dr. Charles A. Summers received his B.A. from Davidson College, earned his Master of Divinity degree from Louisville Presbyterian Seminary in Kentucky, and his Doctor of Ministry degree from Columbia Presbyterian Seminary in Atlanta, GA. He did post-graduate work in Biblical Studies at the Catholic University of America in Washington, D.C. Rev. 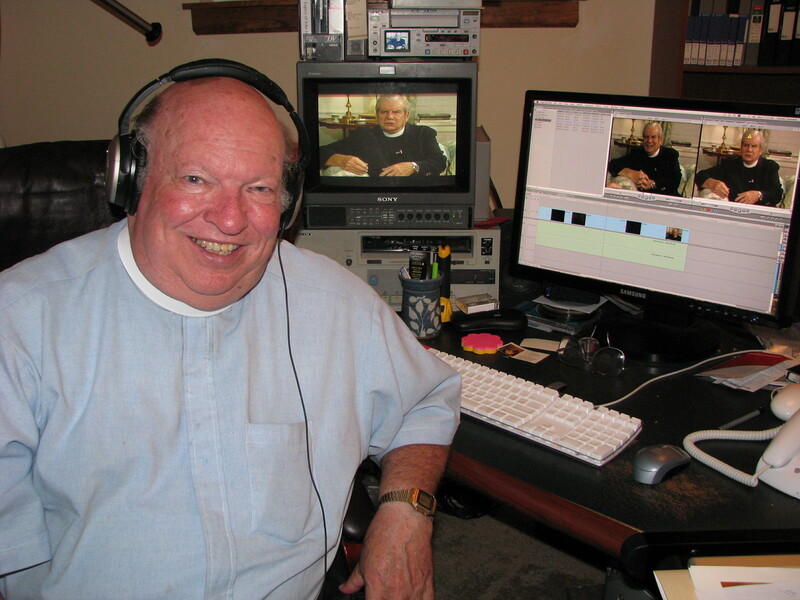 Sumners is also an accomplished producer of Christian and secular documentaries for over 35 years. Dr. Scott Munger also offered a humanities perspective on the King James Bible. He was the topic of an earlier post. We are sharing our experiences in the hope that other communities hosting Manifold Greatness can use it to enhance their celebrations while the exhibit is on display in their cities. 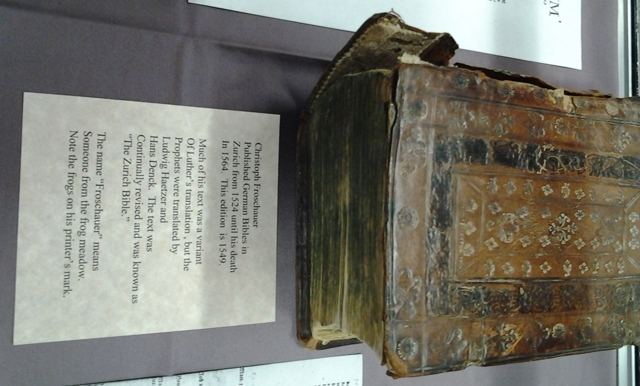 A family Bible displayed at a workshop hosted at the University of Minnesota. Courtesy of the University of Minnesota. Hard to believe the panel exhibition of Manifold Greatness has been traveling across America for a year! Like you, I’ve followed its progress, reading reports from Whitworth University (Spokane, WA), Winfield Public Library (Winfield, KS), Mobile Public Library (Mobile, AL), and Hope College (Holland, MI). And these are only the posts on the blog’s first page! I remember when Steve Galbraith and I, as co-curators of Manifold Greatness, met with representatives of all the host sites. In September, 2011, the American Library Association hosted a daylong workshop, where Steve and I talked about the genesis and realization of the exhibition, and about what we saw as its most compelling stories. It was fascinating and moving to hear then from all the representatives, as they described the diverse array of events with which they would surround the Manifold Greatness panels. So many of these have now come to pass: lectures and colloquia on the translation of the Bible, on the influence of the King James Bible on American writers, on family Bibles, on rare book preservation, and much more. Through the wonders of communication technology, we’ve been able not only to read about these celebrations but to see photographs, and even watch a live stream of the colloquium at the University of Minnesota. It’s as if the conversation we started at the Folger is ongoing, being joined and carried on by other communities across the country. In a way this reminds me of the spread of the King James Bible itself. I wrote in the exhibition book about Parson Weems, the almost legendary Bible salesman of the Philadelphia printer Matthew Carey. Weems hawked Bibles in the 1790s and early nineteenth century in Maryland, the Carolinas, Georgia, and his native Virginia. But he sold Bibles to Northerners, too. From New York he wrote to Collins that their publishing plans had “knock’d up just such a dust here among the Printers as would a stone if thrown smack into the center of a Hornet’s nest.” As an interesting aside, Weems was also the author of The Life of Washington , a collection of stories about America’s first president and the origin of the famous (but untrue!) anecdote of young George Washington chopping down his father’s cherry tree. Weems was the Johnny Appleseed of Bibles, planting them wherever he and his horse rode. Weems’s efforts were later eclipsed by those of the American Bible Society, whose goal was to put a Bible (King James Version) in every household. By mid-19th century they were printing and distributing a million Bibles a year. In the twentieth century, the Gideons took on the task of putting a Bible in every hotel room. The huge dissemination of the King James Bible in America ensured its influence on American literature and culture. The influence of Manifold Greatness will be more modest, I’m sure, but like the book it explores, it will have a wide reach. The panels have already traveled to 14 states, and they will reach 13 more before they reach the end of their road in 2013.